MLM goal setting is a must to experience success in your business. Of course you need to take action based on those goals. To achieve success, you must turn your dreams into reality. That is what goal setting will do for you. Goals are the bridge between you right now, and where you want to get to. Why are you setting these goals in the first place? Why do you want these changes in your life? In answering these questions, you’ll paint a vision of your life that you can turn into reality with MLM goal setting. 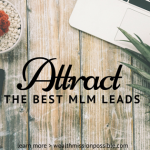 Download this printable PDF of The Best of the Blog about MLM. 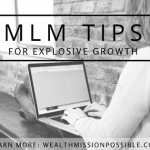 In this article I have some top tips for strategic goal setting in your MLM business. 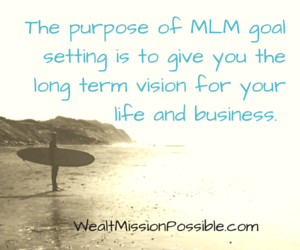 The purpose of MLM goal setting is to give you the long term vision for your life and business. Goals help you to understand what it takes to get to your objective and acquire the skills and daily actions to make it happen. As you start seeing progress with even small achievements towards your goals, your confidence and ability to take those daily actions grows stronger. Starting with your end goal will help you create a road map for reaching it. There is no doubt that you will have to step out of your comfort zone to accomplish more in your life. It’s very uncomfortable, believe me I know! When I first started my network marketing business, I did not step out of my comfort zone too much. The consequence was the poor results I got. Using personal development, I was able to take those baby steps out of my comfort zone and break my goals down into manageable pieces to help me move forward. Do you ever feel fearful to move forward? That’s very natural and exactly why you need to force yourself to do something different if you want to succeed in MLM. 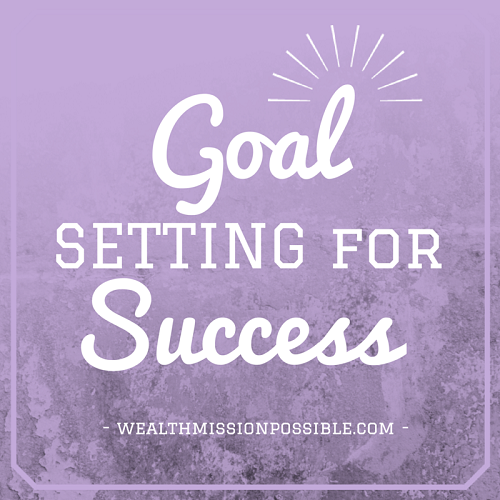 Here are a few MLM goal setting strategies to help you push to realize your vision. One important MLM goal that people often neglect is developing your story. What story can you start living now in terms of your personal development, team building, rank advancing, and how you are growing your organization. Not matter what MLM goal setting you are doing, developing your story should be first. Your vision is really about developing into a leader and becoming more than you are right now. That’s how you create your story. Just imagine how your inspirational story will impact your team and new people you talk to. Your story can contribute to the growth of others and you can become more by creating a new story on your journey to MLM success. Very often network marketers focus so much on recruiting for their team, they forget about how important it is to create a customer culture within the team. One important MLML goal setting strategy is to develop a team that gathers customers. People who use and get benefits from the products on an ongoing basis will increase volume in your downline. When you increase your customer base and teach others on your team to do the same, your own business and your team will experience growth. Customers have always been a top priority in my own business and I now am blessed with thousands of customers, many who are on monthly autoship. In addition, these are people who love the products and are open to hearing about the business! With a focus on customer growth and teaching others to do the same, the rank and income take care of themselves. Will you use this MLM goal setting strategy in your business? Your goal should be very specific and not general. If your MLM goal setting is too general, it will be difficult for you to build the steps to make it happen. See what I mean? 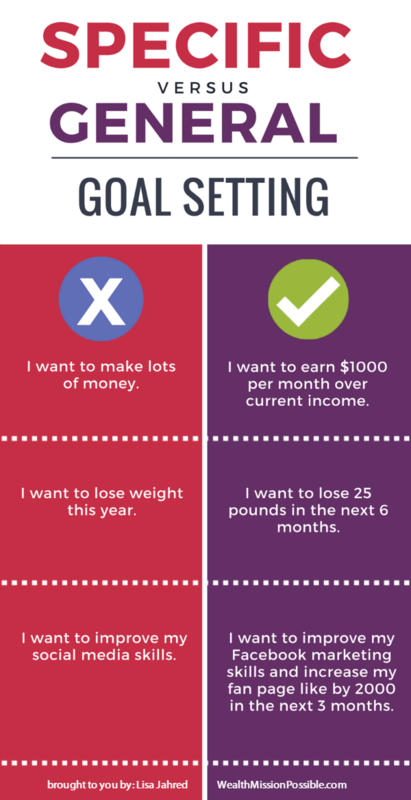 What type of goal setting are you doing? Are you being specific? Specific goals are actionable. If you are too general, it’s like getting in your car without an exact destination in mind. How would you plan your route if you don’t know exactly where you are going? Can you see how you could create an actionable plan for the second goal? What type of specific MLM goal setting will help you get closer to your vision for your life? Even if you do everything right, you still need to measure your progress. In the example of losing weight, you would weight yourself on a specific day to see if you made progress. Every day your daily actions will accumulate to achieve the larger goal. 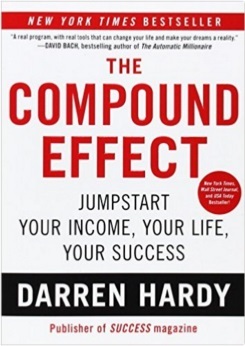 A great way to learn more about how your daily actions lead to success or failure is in Darren Hardy’s book, The Compound Effect. 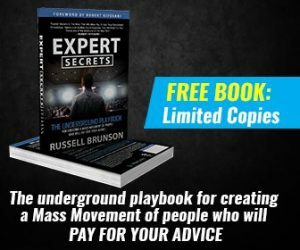 The basic message of this book is so powerful: Little, everyday decisions will either take you to the life you desire or to disaster by default. Before you ever start MLM goal setting, I highly recommend The Compound Effect or another book with a similar message. Here’s another great book to read by Jeff Olson: The Slight Edge. With both these books you can learn how to achieve your goals on a grand scale by turning simple disciplines into massive success and happiness. Have you read either of these books? What did you like best and how did these concepts change your life? 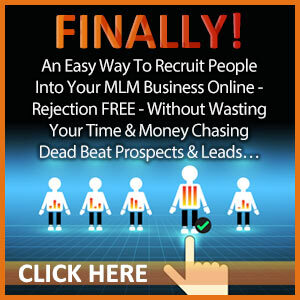 I gave you a few ideas about MLM goal setting for massive success. Think about goals that will force you to grow and help contribute to other people. If you only take care of yourself, you won’t get much satisfaction or reward from that. But if you achieve your MLM rank because you help others get to where they want to go, then there is the reward. Are your current habits serving your purpose or contributing to your vision? What habits and routines can you implement in your life to contribute to making your goals a reality? Evaluate the skills do you need to get better at the daily actions to need to fulfill your vision. PS Are you struggling to find new people for your business? 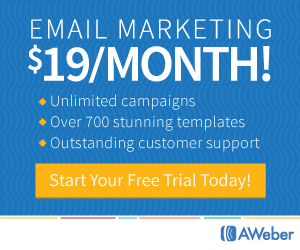 Find out how to get more leads here.